University; essays, lectures, meeting life long friends and amazing memories. That's what I think of looking back at my time at university.. I graduated two years ago now and I met my best friends and my fiancé at university. It was 3 amazing years of my life, but what happened when it ended? Personally, I just felt lost. I left my home and moved two hours away to a city I'd never visited before to study Criminology. Looking back, although I still find Criminology immensely interesting, it wasn't the right choice for me and that was my first mistake. In terms of career prospects, there wasn't anything I wanted to do in that field and as time went on, I realised more and more that maybe I should have put more thought into my degree instead of picking something I just 'liked' at the time. Although realising I wasn't going to be using my degree for anything, I worked extremely hard, like we all do, to achieve a target grade. There's still so many jobs out there that I could apply for as a graduate that need a minimum of 2:1. The rest of my time was set on getting a good grade, without thinking too much about career prospects, my second mistake. Finding a job isn't easy. Leaving university is a strange feeling. It's like you've been living in a bubble for 3 years of your life and not realising the world carrying on around you. I moved back home (but more about that later) and searched for a job. You have to remember you are competing with thousand of other graduates. A degree doesn't give you a right to a job. This was drummed into me at school, 'you've got to go to university to get a good job' but no one tells you how hard it is. I'm not naive. I didn't think it would be easy, but it took me 8 months to find something permanent. I left uni and took a lot of temping roles. Exam marking, admin jobs and retail jobs. Starting a new job every month or so is seriously exhausting and it made me loose my confidence slightly. First day nerves, meeting new work colleagues and training for a new temp jobs every couple of weeks was tiring. I was trying to find a full time job, but remember the competition for jobs, my degree irrelevance and lack of confidence meant it was 8 months after finishing university that I finally found something. I want to say it was a fantastic graduate opportunity that I was excited for; but it wasn't, I settled. Apart from a rare few, once you've finished university you move back in with your parents house. It's not glamorous and it takes some time to readjust to. Sure, it's nice having your dinner cooked for you now and again and living in a nice and clean non student house, but the independence you've had for 3 years? Yeah, you loose that. Now you won't be able to leave the house without someone asking you where you are going and when you'll be getting home. I'm not meaning for this to sound ungrateful, because I'm not, but it does take some time to readjust to. There's a lot of competition for jobs. Scrolling through your Facebook in the middle of July, what do you see? Happy graduation photos and people handing in their dissertation. There are so many graduates out there looking and applying for this same jobs as you. You are 1 in thousands, the competition for job is high and you need to be determined and not loose focus. Coming home, my best friend had moved to the other side of the world and my uni friends were dotted around all over the country. After being surrounded by my two best friends constantly, being on my own was strange. I'm not going to lie, it feels lonely. I've not even started paying it back yet and when you do, you won't hardly notice it, I promise. Those friends you've made at university? They'll be life long friends. Years of hard work and determination, you've come out with a degree! All the stress is worth it and it shows a strength of character. I was so quiet and not very confident when I started uni, but the first day when you're thrust into a situation where you don't know anyone, you're forced to make friends and put yourself out there and this really helped my confidence. You learn a lot more than what you're taught in lectures. Yes, so leaving university was difficult for me. I wish that I had spent more time concentrating on what to do after uni and help my career, such as volunteering or going to job fairs. I'm not a huge drinker, I didn't go out every weekend instead of concentrating on my education - you couldn't be more wrong. I worked hard, but I just ignored the fact I would be leaving university. I pretended it wasn't happening. Saying all this, once I got myself settled I couldn't be more happier. I've finally found a job I enjoy (still not relevant to my degree and not one I settled in either), I've moved cities and into a flat with my fiancé and one of my best friends is a 40 minute train ride away. After 2 years, I finally feel like I am where I want to be. I guess I'm writing this post as I've seen so many tweets about people dreading entering the adult world and worried about their future. Yes, it's scary and it seems daunting with no job and no stable income at first, but it's exciting! The moment you've graduated, you can do whatever you want! You can go work abroad, travel the world, settle into a job you love, even go back into education if you want- it's your time. Don't dread it, grasp is with two hands and enjoy every minute of it! But don't worry either. Things take time. You might not get a job quicker than you friends or move out before them, but you've got time. You will get where you want to be. Some people just get a little lost along the way, like me. 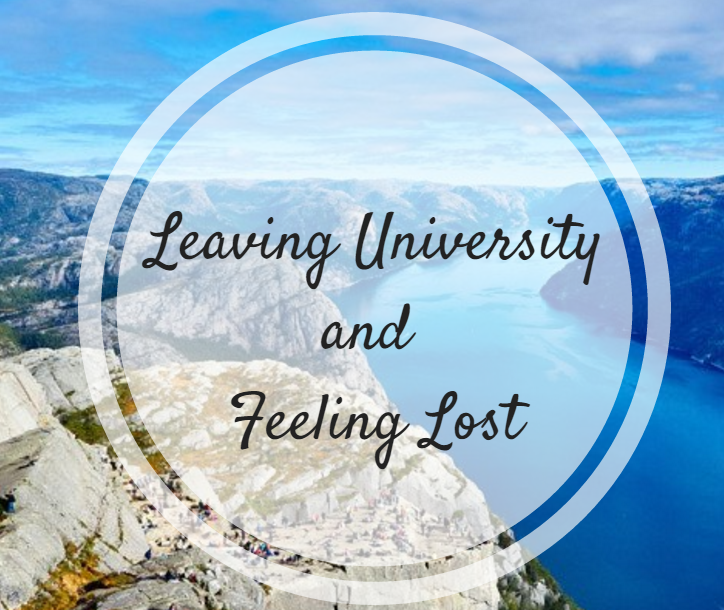 How did you feel about leaving university?